Supporters of legislation that would stiffen penalties for soring sent a message to federal lawmakers last week: Giddyup. Introduced in April 2013, the Prevent All Soring Tactics (PAST) Act has been sitting in a House subcommittee for the past year and will die if the current Congress fails to advance and approve the bill by January 2015. 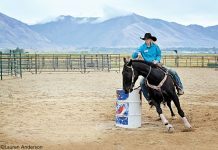 Soring is the deliberate infliction of pain to produce a high-stepping, exaggerated gait in certain gaited performance horses. Representatives of the American Veterinary Medical Association joined horse owners and other backers June 18 for the Walk on Washington. 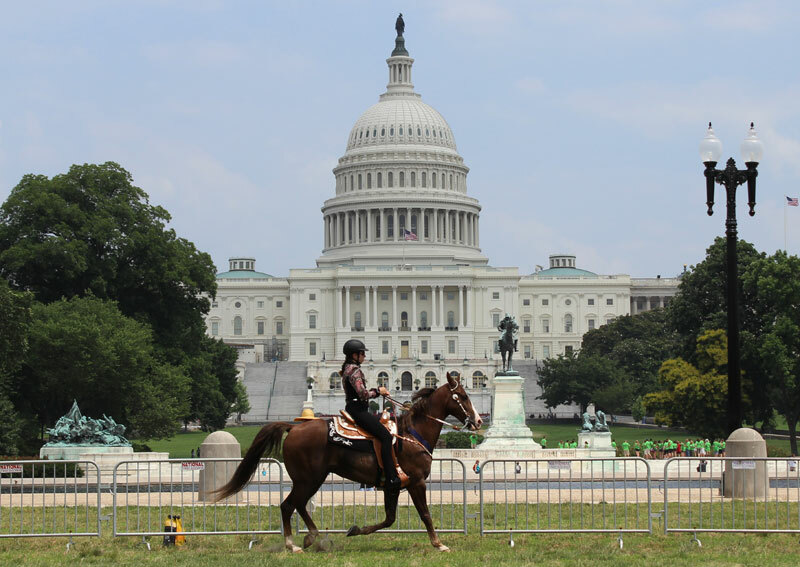 Tennessee Walking Horses, Spotted Saddle Horses and Racking Horses paraded through Union Square in view of the U.S. Capitol in support of the proposed law, which counts 292 House members and 56 senators as co-sponsors. The American Association of Equine Practitioners and dozens of other veterinary, horse industry and animal protection groups have called on Congress to pass the bill. Makes the actual act of soring, or directing another person to cause a horse to become sore, illegal, whereas the original act only banned showing, transporting, or auctioning a horse that was sore, not the actual practice. Increasing civil and criminal penalties for violations. Prohibiting the use of action devices such as boots, collars, chains and rollers that encircle or are placed upon a horse’s leg. Protective and therapeutic devices would be permitted. The PAST Act was introduced by Rep. Ed Whitfield, a Kentucky Republican, who attended the Walk on Washington. AVMA has been lobbying Congress on behalf of the PAST Act. The group’s executive vice president and past president, Ron DeHaven, DVM, testified in November 2013 before the House Subcommittee on Commerce, Manufacturing and Trade, where HR1518 is lodged. “It is my hope that the members of the subcommittee will swiftly mark up and favorably report the PAST Act, which will provide the statutory changes necessary to protect the health and welfare of our nation’s walking horses,” he said at the time. U.S. Rep. Steve Cohen, a Tennessee Democrat, was among the co-sponsors who spoke at the Walk on Washington. Victoria Broehm, the communications manager with AVMA’s Governmental Relations Division, reported on the Walk on Washington in her AVMA@Work blog. Liked this article? Here are more resources on soring and gaited-horse welfare. Have any of these people been to a show or a barn or are they going on videos??? The past act doesn’t stop soring it eliminates an entire multi billion dollar industry!!! I respect their passion but this is a HSUS sponsored money raising agenda!! The leadership is sponsored by HSUS !! Whit fields wife is a paid lobbyist for HSUS!! Sec of agriculture a wife just got a huge campaign donation!!! The asst to Whitfield is bannerd by the walking horse industry !! He was showing padded horses a year ago!! He gets banned by the TWH industry and now how hates the industry!! Ask his family and his ex wife what is true!! I will let him answer these question himself!! Do you want HSUS to be able to come into your property and take your stick??? Everyone has the right to their opinion !!! Have you been to a show recently?? The industries problems have been well documented but changes have taken place!!! 3000 horses a year die on the track!! Quarter horse trainer caught abusing horses why is the TWH only discriminated against?? The industry has taken steps to end all the issues, what other breeds can say this!! This bill is a HSUS agenda lead by people they pay!! You want to end the horse show industry??? This is the beginning of the of animal agriculture!!! HSUS just lost a lawsuit for racketeering and Rico Act!! You want more corruption in this country?? What about the budget,Benghazi,the irs and if course Obamacare!! You think congress has time for this??? I hope not we have more pressing issues!!! Love your passion and respect your views!!! I don’t own a horse!!! I do hope they hurry up and pass this act. It’s shameful that soring is still going on. I have to agree with pat there are more pressing matters in this country than the attack on TWH what is this bill going to do that the association hasn’t tried it will continue. What will be attacked next in animal agriculture barrel racing, steeple chasing, racing, 3 day eventing all the rodeo events? I find it funny, sad but funny, that those who are against the PAST Act only argument is it will destroy the “industry”. Well, there are many Tennessee Walking Horse shows throughout this beautiful country that do not allow pads and chains that are thriving. That tells me the “industry” is surviving outside the pads, chains and torture these individuals claim. I also find these folks who are against the PAST Act try to divert the focus to others such as the HSUS, Gee, in my opinion, if there was nothing going on, the HSUS would not have gotten undercover video of Jackie McConnell torturing a horse, Larry Wheelon’s barn would not have been raided and 19 tortured horses would not have been seized (note: Mr. Wheelon is still awaiting trial and is innocent until proven guilty). I don’t think it matters who may have initiated the PAST Act, it is long overdue. Clearly, the “industry” has not been able to clean up their act. The only time I ever saw a sored horse was when I was living in Tennessee at a small local show. It broke my heart and I was embarrassed to be living in a state that allowed such torture. the most common compliant from the sore hose industry is that it will shut down their shows. The only ones that will shut down are those where Horse Protection Act violations are most prevalent. That is where the horses wear stacks, chains and ultra heavy shoes. Take away their soring tools and shows will still go on all over the country. Last week there was a big 4-day USEF Saddlebred show in Syracuse. 251 SADDLEBREDS and 151 MORGANS. That is a big show. Between the 2 breeds there were no more than 6-8 Park style horses there. The Saddlebred association has learned that their future is in the pleasure horse division and the youth. Morgans learned that many years ago. The TWH is in its death throes because of the leadership of it’s breed organization has supported, defended and awarded sore horses and trainers for 50 years. The organization bragged about having 20,000 in the late 90s. Their membership now barely makes 6000 and is still dropping. Yet they STILL don’t get it. The American people will not stand for animal abuse of any kind. This bill will eliminate ALL pads and chains. Without the action devices, the other soring methods will be useless. The industry has been given 40+ years to clean up their act and they used that time to develop more and more insidious ways to cheat and fool the inspectors and the horses are the ones who have paid the price. It is one of the things that disgusts me most about our government that this bill could have SO much support yet still be stuck because of the money and power of a few legislators with special interests.